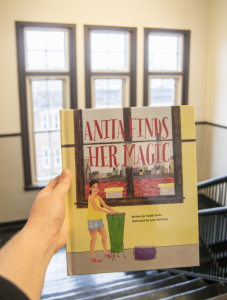 Anita Finds Her Magic is a children’s book written and illustrated by two young artists from The Chicago High School for the Arts. Together they collaborated in developing the story of Anita, a young musician on a journey to grow her talent along with the diverse friends and mentors she meets along the way. It is a heartwarming story that encourages little readers to explore the many paths that art has to offer, and expresses an authentic message that will excite any young reader to explore new ways to express their own creative talent. ChiArts Author, Ysobel Gallo is a people-watcher: on the bus, on the streets, at the lunch tables. All the characters in this story are based on real people and places she has seen in her community. The initial plot was inspired by a drumming instructor who lived down the street and filled the evenings with beats. Outside of these interests, Ysobel is currently a student in the Creative Writing Conservatory at The Chicago High School for the Arts. She has received silver medals in the regional Scholastic Art and Writing Awards for both fiction and poetry. 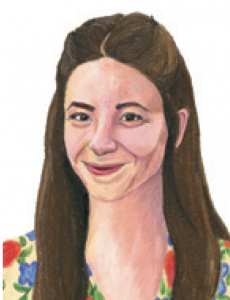 ChiArts Alumni Illustrator, Jane Manfredi knows just what it is like to audition for a spot at The Chicago High School for the Arts. She graduated from the first ever class in 2013 and went on to the School of the Art Institute of Chicago where she graduated with a BFA in 2017. 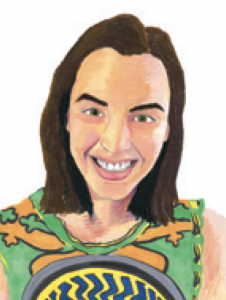 Jane currently lives in Asheville, North Carolina where she is pursuing a career as an independent illustrator. This is Jane’s first children’s book. → The ChiArts Associate Board (ChiFive) is seeking relationships with small business partners who want to help cultivate the passion and interest of Chicago’s emerging artists. → 100% of proceeds will benefit ChiArts’ tuition-free arts programming. Suggested minimum purchase of five books. → Supporting partners will receive ChiArts bookmarks, and reusable ChiArts-branded bags* with purchase of 10 books or more. If you are an individual interested in buying Anita Finds Her Magic for personal enjoyment, please feel free to purchase through our Amazon link here.